The Canfield Mountain Trail System has more than 32 trail miles in the system. It was designed for motorized trail bikes and mountain bikes, however it is open for all uses (i.e. hiking, etc...) except for ATV's. 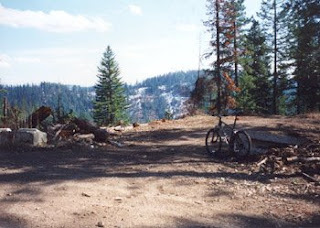 The trail system was designed, so that the entire network can be accessed from an old logging road that use to be open to cars and trucks, but is now closed (Road 1562). The trails are a mix of logging roads and single track and range from 0% to 35% grades. The trails are marked with numbers and there are maps at trail junctions, indicating where you are in the system. Trails with letters for the name (i.e. trail "A") run cross ways or horizontally on the mountain and trails with numbers for the name (i.e. trail "5") run up and down or vertically on the mountain. From the Nettelton Gulch Parking Lot (which is the entrance on the the old logging Road 1562) to the highest point in the trial system (West Canfield Butte, 4162ft. ), you can travel approximately 4 miles and 2000ft. in elevation gain. Trails can be smooth, well-groomed logging roads or steep single track with ruts, loose rocks, roots, drop-offs and other obstacles. Single track trails receive annual maintenance in the Spring, but because of the motorcycle use, they're usually pretty rough (which makes for some fun downhill). Also, for you pet owners, dogs are allowed on the trail system. 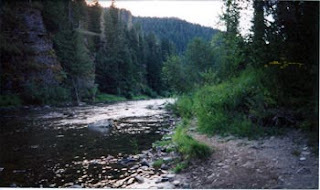 Big Hank campground is located on the banks of the North Fork of the Coeur d'Alene River in the Idaho Panhandle National Forest. This Forest comprises about 2.5 million acres of beautiful mountains, clear lakes and rivers, ancient cedar groves, fish and wildlife for a host of outdoor activities. Specifically, Big Hank is a medium to large size campground on the banks of a beautiful river. The location makes for easy access to numerous outdoor activities including opportunities for fishing and water sports, not to mention the numerous hiking and biking trails in the forests nearby. The campground has 30 campsites with fire rings and tables, restrooms and potable water. This campground is not handicap accessible and is classified as a tent campground because of the lack of power hookups for trailers. There's a 14-day limit on stays and all sites are on a first-come-first-serve basis. Big Hank is a fee campground. There are no reservations allowed at this site and camping is allowed only in designated spots. All vehicles, RVs, and trailers must be parked in the campsite or its driveway. Quiet hours are between 10:00 p.m. and 6:00 a.m. Within campgrounds and other recreation areas, fires may only be built in fire rings, stoves, grills, or fireplaces. Be sure your fire is completely extinguished before leaving. Do not leave your fire unattended. There is a limit of 8 persons per campsite. Pets are allowed on leash. And finally, use of fireworks or other explosives within campgrounds and other recreation areas is prohibited. NOTE: Big Hank Campground is one of several campgrounds located along this section of river. Others include Berlin Flat Campground and Kit Price Campground to name a couple. If one is full, just continue to the next one. Barlow Point is located in the Mt. Baker-Snoqualmie National Forest of Washington State. This immense forest ranges from Mt. Rainier National Park north to the Canadian border. MBSNF includes over 1,711,241 acres of prime forestland, eight Wilderness areas, and the Skagit Wild and Scenic River, which hosts the largest population of wintering bald eagles in the United States. In this National Forest are two of Washington's volcanoes, Mt. Baker and Glacier Peak, and there are some 1500 miles of hiking trails to explore. This vast area is divided into four ranger districts, with several visitor centers to serve the needs of everyone from mountaineers challenging glacier-hung peaks in the backcountry to touring families taking advantage of some of the most dramatic scenery accessible by car. All travelers should be aware that the Cascade Mountains create their own weather. Check local weather stations and pack for a wide variety of conditions, from sun to rain, to the possibility of year-round snow at higher elevations. 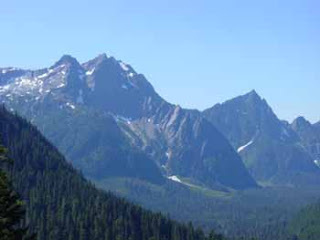 The Barlow Point trail is located in the Darrington Ranger District which includes 570,000 acres of majestic mountains, glacier fed rivers and ice-capped peaks to explore. The history of Monte Cristo dates back to the 1890's, when gold was discovered and a railroad was built along the South Fork of the Stillaquamish River, later to be used as a passenger train. The train brought people from all over to the Big Four Inn, where they could hike to the only ice caves in the area. The Mountain Loop Highway enables people to travel from Granite Falls to Darrington. While driving the loop road you can experience a wide variety of attractions. From old mines, the old chimney at Big Four, avalanches, beaver ponds, waterfalls and slow moving rivers. Even the historical guard station on the Suiattle River still remains. As for the trail, Barlow Point trailhead is also the trailhead for the Old Government Trail, which splits off a half mile in. The trail was an earlier route over Barlow Pass to Monte Cristo. For the first half mile the trail goes up and down, twisting to and fro. There is an old, rotten cedar puncheon along this section of the trail, followed by two tight switchbacks. Wildlife such as Chipmunks and Red Racer Snakes can be seen along the rock outcrops on the trail. Keep to your right on all the trail divides, there are three in all. The second divide leads to the old railroad grade, seen down below the trail. The third divide is for the Old Government Trail. The Old Government Trail runs west, parallel with the Mountain Loop Highway, for three miles or so. The next section of the trail is one of the steepest around, gaining 900 feet in less than a half mile. The trail runs parallel with the Mountain Loop Highway, then after 13 switchbacks and a long, winding stretch through the forest, then up and over a ridge. The forest has a high, dense, tree top canopy, with very little brush growing on the forest floor, which is most unusual for this area. The trail then runs parallel with the South Fork of the Sauk River, on the north side. Contouring along the hillside are trail sections without the switchbacks. Some dead old growth trees show an unbelievable spiral growth pattern along the trail. There are three more sets of switchbacks on the remainder of the trail. The last set of eight switchbacks are very tight and lead up through some rock outcrops, which are on either side of the trail, then the trail drops down to Barlow Point. At one time, an old lookout stood here, but unfortunately, there are no remains to mark its one time existence. Barlow Point is a rock outcrop on the hillside looking westward at an elevation of 3,300 feet. Views include Big Four Mt., Halls Peak, Mt. Dickerman, Twin Peaks, Sheep Mountain, Mountain Loop Highway, and Stillagaumish Valley below. Use caution on the rock outcrops they can be slippery when wet.